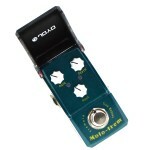 The JOYO Molo Trem is a very versatile tremolo guitar effect pedal in a small enclosure. Tremolo is a modulation effect that creates a change in volume, while the "tremolo arm" on your guitar is actually vibrato, which is varying pitch. The JOYO tremolo pedal works by using an LFO (low frequency oscillator), this is used to create a waveform that is used to turn the signal up and down. Using the JOYO molo trem tremolo pedal you can adjust the rate and the intensity of this signal, giving you full control over the tone. The tremolo effect pedal enables the use of different wave shapes to modify the tone, turn the 'Wave' control to the left we can modify the volume using a sine wave, turn to the right a triangle shaped wave takes control. Sine waves are rounded waveforms that produce a strong smooth tremolo effect, while a triangle wave, with its straight, linear rise and fall, creates peaks and valleys that can command attention and cut through a mix. The tremolo is designed for creating volume change, so to control the amount, you have two controls; 'Rate' controls the speed of the wave and 'Depth' will control the amount or intensity. A twist of the rate control will allow you to set the effect to the tempo of your song. The 'Depth' will adjust the intensity of the peaks and the troughs of the signal. The Molo trem gives you full control, the the left adopt a subtle sign wave for creating smooth & mellow variations in the volume, or a full twist of the 'Wave' to the right where the molo trem touches on a squarewave. The square waveform is perhaps a little outside the norm for traditional use, but with the intensity up high this produces a stuttering effect to the guitar signal. With the depth set to maximum, squarewave LFOs will alternate the signal on and off, making for a dramatic stuttering effect. A very versatile pedal for adding extra warmth and emotion to your playing, a great pedal from JOYO Ironman guitar effect range! The JOYO JF-05 Classic Chorus pedal has just that, the classic chorus sound that is heard on masses ..
JOYO JF-315 Metal Head Distortion Mini Guitar effect pedal is taken from the 3rd generation of JOYO .. The JOYO multifunctional wah pedal has two modes and a Q control for adjusting the frequency of the ..